Marshal Gregory Zhukov, the legendary Russian commander, said the Macedonians had suffered a catastrophic defeat in India. In the final part of this analysis, fact and fiction are separated. After defeating Persia in the year 334 BCE, Alexander of Macedon was irresistibly drawn towards the great Indian landmass. However, the Persians warned him the country was no easy target; that several famous conquerors had fallen at the gates of India. The Persians told him how their greatest king, Cyrus, who had conquered much of the civilised world, had been killed in a battle with Indian soldiers exactly two centuries before Alexander. And in an earlier antiquity, the Assyrian queen Semiramis, who had crossed the Indus with 400,000 highly trained troops, escaped with just 20 troops, the rest being slaughtered by the Indians. In his book, Foreign Influence on Ancient India, Krishna Chandra Sagar says 150 years before Alexander, Indian archers and cavalry formed a significant component of the Persian army and played a key role in subduing Thebes in central Greece. Alexander, however, knew no fear. More than anything else, he wanted to invade India. It would prove to be a strategic blunder. This statement by Russia’s Marshal Gregory Zhukov on the Macedonian invasion of India in 326 BCE is significant because unlike the prejudiced colonial and Western historians, the Greeks and later Romans viewed Indians differently. For instance, Arrian writes in Alexander Anabasis that the Indians were the noblest among all Asians. In fact, Arrian and other Greeks say the Indians were relentless in their attacks on the invaders. They say if the people of Punjab and Sindh were fierce, then in the eastern part of India “the men were superior in stature and courage”. All this is glossed over by Western historians, in whose view the one victory over king Porus amounted to the “conquest of India”. But the Greeks made no such claim. 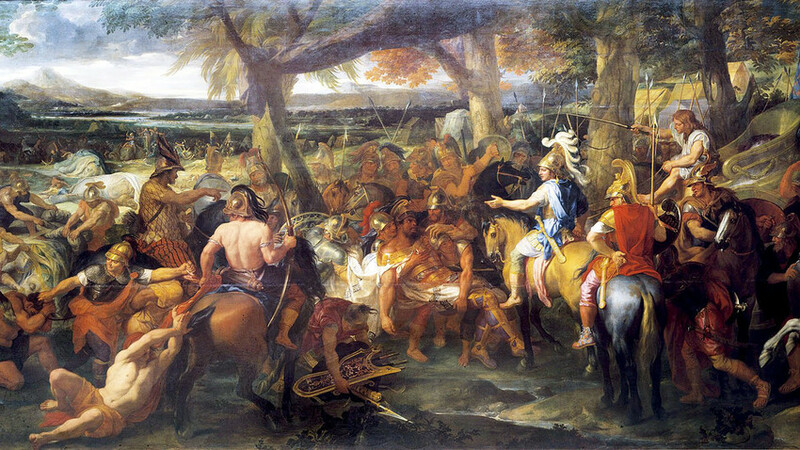 Alexander’s army did not indulge in celebrations after the Battle of Gaugamela where they defeated 200,000 Persians. No wild festivities were announced after the Battle of Issus where they defeated a mixed force of Persian cavalry and Greek mercenaries. The fact they celebrated after the Battle of Hydaspes suggests they considered themselves extremely lucky to survive after the clash with the Hindu army, with its elephant corps. If Porus lost, why reward him? According to the Greeks, Alexander was apparently so impressed by Porus he gave back his kingdom plus the territories of king Ambhi of Taxila who had fought alongside the Macedonians. This is counterintuitive. Ambhi had become Alexander’s ally on the condition he would be given Porus’ kingdom. So why reward the enemy, whose army had just mauled the Macedonians? The only possible answer is at the Battle of Hydaspes, the Macedonians realised they were dealing with an enemy of uncommon valour. Sensing defeat they called for a truce, which Porus accepted. The Indian king struck a bargain – in return for Ambhi’s territories, which would secure his frontiers, Porus would assist the Macedonians in leaving India safely. Alexander’s post-Hydaspes charitable behaviour, as per Greek accounts, is uncharacteristic and unlikely. For, in battles before and after, he massacred everyone in the cities he subdued. Why pay off a vassal? Before the battle, Alexander gave king Ambhi 1000 talents (25,000 kilos) of gold for fighting alongside the Macedonians. The only explanation is Ambhi was driving a hard bargain. He knew the rattled Macedonian army was seeking to quickly exit India. He thought he could use the Macedonians to remove his rival Porus. However, Porus’ decision to offer Alexander combat checkmated those plans. Greek sources say Alexander retreated from India because his soldiers were weary, homesick and close to mutiny. Imagine if German soldiers had told Hitler they were tired of fighting? They would have been summarily shot. In Alexander’s time, the punishment was crucifixion. The Macedonian army had a system of rotation where large batches of veteran soldiers were released to return home (with sufficient gold and slaves). In their place, fresh troops eager poured in from Europe. If they were weary of constant warring, it is inexplicable why these soldiers chose to fight their way through obstinately hostile Indian territories. The homesick soldiers would have preferred the garrisoned northwestern route they took while coming in. Why would a brilliant commander subject himself and his troops to further violence when all they wanted was a peaceful passage home? Clearly, the Macedonians were in a mess and not thinking straight. Not the sign of a victorious army. Alexander’s tragedy was he was in a Catch-22 situation. The Macedonians and Greeks welcomed the wealth from the conquered lands, but the man who ensured this flow was persona non grata. In Greek eyes a Macedonian was hardly an equal. The Greeks hated Alexander for sacking their cities and enslaving their people. In his own country, he was an outsider for being half-Albanian, from his mother’s side. The common people suspected him of murdering his father. So in order to retain the loyalty of his troops, Alexander had to wage constant war while also taking great personal risks in battle. For, he could not be seen as weak, let alone beaten. A few years before the Indian campaign, a large part of the Macedonian army was massacred by the Scythians (Hindu Shakas, the Buddha’s clansmen) at Polytimetus, present day Tajikistan. Alexander warned his surviving troops not to discuss the massacre with other soldiers.